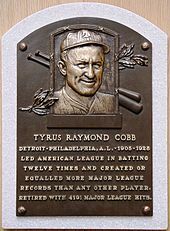 ^ "Ty Cobb". Encylopaedia Britannica. Retrieved December 17, 2017. ^ "Ty Cobb history built on inaccuracies". MLB.com. Retrieved December 30, 2018. 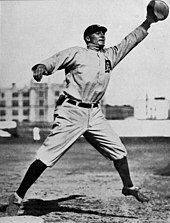 ^ "How Ty Cobb the truth got lost inside Ty Cobb the myth". Detroit Free Press. Retrieved December 30, 2018. 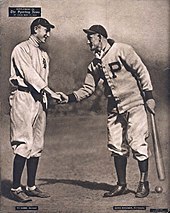 ^ "The Softer Side of Ty Cobb | The Saturday Evening Post". www.saturdayeveningpost.com. Retrieved December 30, 2018. 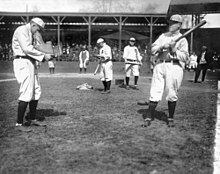 ^ "Facts and Figures – Baseball batting champions". Baseball Digest. November 2000. Archived from the original on August 3, 2008. Retrieved January 25, 2009. ^ a b c d Gurtowski, Richard (July 2005). "Remembering baseball hall of famers who served in the Chemical Corps". CML Army Chemical Review. Archived from the original on February 22, 2006. Retrieved March 10, 2007. ^ Kalish, Jacob (October 2004). "Fat phenoms: are hot dogs and beer part of your training regimen? Maybe they should be". Men's Fitness. Archived from the original on January 20, 2005. Retrieved March 1, 2007. ^ Bisher, Furman (1958). 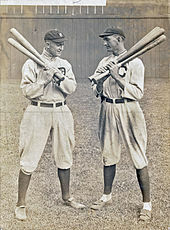 "A Visit with Ty Cobb". Saturday Evening Post. 230 (50): 42. Retrieved February 27, 2018. ^ Salsinger, H.G. (2012). 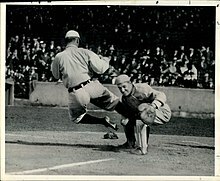 Ty Cobb. US: McFarland. p. 162. ISBN 978-0-7864-6546-0. Archived from the original on January 28, 2013. Leerhsen, Charles (2015). 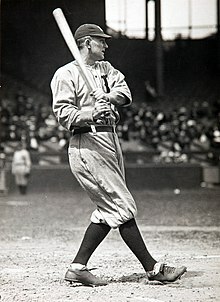 Ty Cobb: A Terrible Beauty. New York, N.Y.: Simon & Schuster. ISBN 1-451645-76-7. Cobb, Herschel (2013). Heart of a Tiger: Growing Up with My Grandfather, Ty Cobb. Toronto: ECW Press. ISBN 978-1-77-041130-2.